05 Dec 2018 --- Bolstered by record exports, a rise in micro-breweries and increased interest in low-alcohol products, Europe’s beer production rose to an eight-year high in 2017, according to The Brewers of Europe’s (BoE) latest report on Europe’s beer sector. Production increased by 200 million liters to 39.6 billion liters, exports reached an all-time high, with one in five beers shipped abroad and a third of that was to outside the EU. Germany, the UK and Poland were the top three producers. Other countries brewing high volumes of beer were Spain (3.8 billion liters, or 9 percent), The Netherlands (2.4 billion liters, or 6 percent), France (2.1 billion liters, or 5 percent) and Belgium (approximately 2 billion liters, or 5 percent). Click to EnlargeCompared with 2016, Portugal, which was up 8 percent, recorded the highest increase in the production of beer, followed by Italy (+7 percent), Slovakia and the UK (both +6 percent) and Cyprus (+5 percent). As the leading producer, one in every five beers produced in the EU originates from Germany, which produced 9.3 billion liters, followed by the UK and Poland (both at 4 billion liters produced, each representing 10 percent of the total). 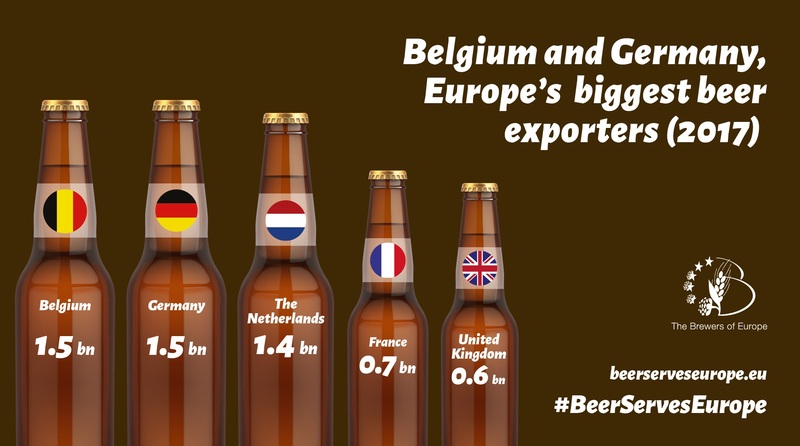 Germany and Belgium exported the most beer outside their countries, with 1.5 billion liters each. 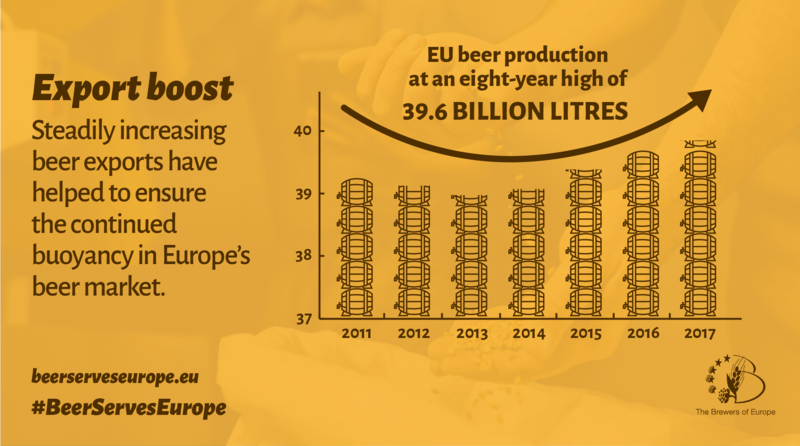 There are several drivers at play when it comes to the production and export boost for European beer. “ The EU opening new markets and bringing down barriers to trade, a greater surge for diversity and choice worldwide and global consumers are attracted to European brands and beer tradition (diversity of EU market offering is key). In addition, there are specific export developments programs, in Poland for example,” BoE Secretary-General Pierre-Olivier Bergeron tells FoodIngredientsFirst. “What we have observed is a drop in the overall alcohol consumption, but an increase in beer consumption. It means consumers are shifting to beer which is seen a lower alcohol content drink in general,” Bergeron notes. The top destination countries outside the EU for Europe’s brewers are the US, China and Canada. 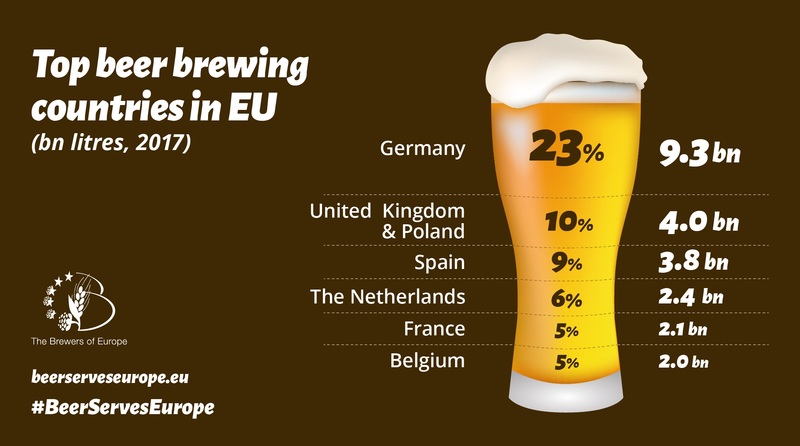 However, over the past twenty years, Europe’s brewers have extended beer trade to 123 countries around the world. The US was by far the main destination for beer exports to non-EU countries (1.1 billion liters of beer exported there in 2017, or 31 percent of total extra-EU exports of beer), followed by China (520 million liters, 15 percent), Canada (210 million liters, 6 percent), Korea (175 million liters, 5 percent), Switzerland (111 million liters, 3 percent) , Australia (100 million liters, 3 percent) and Taiwan (95 million liters, 3 percent). Consumer demand is evolving and the sector continues to diversify in response. The EU now produces almost 900 million liters of non-alcoholic beer (2 percent of all beer) each year, according to the report. At the same time, production of lower alcohol beers is also growing. This, coupled with the rise in the number of microbrewers and SMEs over the past year, shows how much the sector has expanded and varied its output. 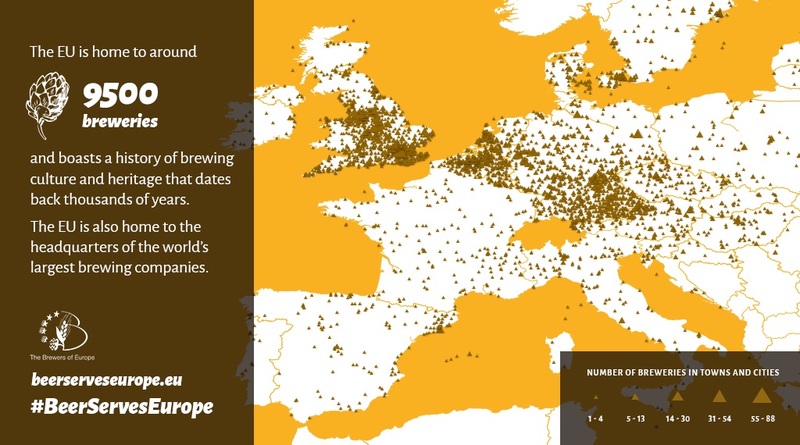 Click to EnlargeThe number of active breweries increased by nearly 1,000 last year alone to almost 9,500 in the EU. Around three-quarters of the 9,500 breweries are SMEs, with the UK now accounting for 2,430 breweries, many of which are smaller producers. There has been an increase of around 6,000 breweries in the last decade. “There are multiple factors at play boosting the rise in microbreweries and SMEs including tax relief for small brewers in Europe, information sharing and easier access to tools and resources for small producers. There are also ‘new’ consumers, especially women and younger generations, who want different beers such as low and no alcohol beers and flavored beers,” adds Bergeron. He also explains how, for the BoE, the EU27 and the UK are closely linked and members are closely monitoring Brexit updates. “The EU27 and the UK are closely intertwined, through interconnected value chains, an international specialized workforce and extensive trading, not just of beer but also of ingredients, machinery and brewing technology,” he says. Bergeron also spoke at the eighth annual Beer Serves Europe launch event held in Belgium last night (Dec. 4), where he explained how beer forms an integral part of European culture and has been enjoyed in communities across Europe for several thousand years as well as its significance to the economy. “The brewing sector is a fundamental element of the European economy, combining local traditions with innovation. The diversification of the sector benefits many areas of the economy: in competitiveness, trade, job creation and innovation,” he said. This demonstrates that a shift towards beer, a typically low alcohol beverage, coupled with the increased availability of even lower alcohol and non-alcoholic beers, is compatible with and maybe even contributing to the improved consumption patterns of Europe’s ever more health-conscious citizens, it says. Innovation across the beverage category has been centered around health and wellbeing, as sugar reformulation and the broader idea of “lighter enjoyment” continues to dominate new product development. Globally, producers are tapping into the growing consumer demand for alcoholic drinks that have been given a clean and clear label makeover as innovators continue to dump sugar and reformulate with more natural alternatives. In the case of beer, a shift in preference spurred by “mindful” thinking and conscious purchasing decisions towards alcohol has led to a rise in the amount of low ABV beers on the market. One example came at the beginning of this year when Irish powerhouse Guinness started to tap into teetotal trends with its very first non-alcoholic lager launch. The Diageo-owned brewers at St. James’s Gate in Dublin introduced “Open Gate Pure Brew” a new, full flavored, non-alcoholic lager that has scored very well in independent taste tests and does not compromise on full-flavor. Belgium-based multinational drink and brewing holdings company AB InBev was enlarged in October 2016 when AB InBev purchased SABMiller and concluded a merger of the two entities. More recently in August, Heineken N.V. signed non-binding agreements with China Resources Enterprise, Limited (CRE) and China Resources Beer (Holdings) Co. Ltd. (CR Beer) to create a long-term strategic partnership for Mainland China, Hong Kong and Macau (together with China). In the context of this partnership, Heineken will become CRE’s 40 percent minority partner in holding company CRH (Beer) Limited (CBL), which controls CR Beer, the undisputed market leader in the world's largest beer market, China. In the same month, BoE criticized a European Commission proposal to include all ingredients in beer, even those added after fermentation, in order to calculate excise tax on alcohol. The proposed revision to the tax calculation system has angered European brewers who claim it would be unfair, discriminatory and completely contradictory to the harmonization objectives of the Directives. Europe’s brewers call for a sustainable tax regime that recognizes beer’s positive impact throughout the value chain, from “grain to glass.” Throughout the value chain, Europe’s 9,500 breweries generate around 2.3 million jobs while Governments across the EU raise almost €42 billion (US$47.7 billion) in tax revenues generated by brewing, including €10.9 billion (US$12.3 billion) in excise duties on beer. The brewing sector injects €50 billion (US$56.7 billion) into the European economy overall, or the equivalent of the Luxembourg GDP, notes the BoE. By the end of this year, two-thirds of Europe’s beer will be labeling ingredients with more than half voluntarily labeling calories in the same way that other food and drink products already have to do. According to the BoE, this is because brewers are also committed to transparency so consumers can make informed choices about their beer intake. 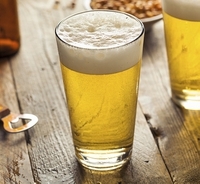 The brewers’ commitment to voluntarily provide understandable, recognizable, comparable and accurate consumer information is one of more than 100 “responsibility commitments” made by Europe’s brewers under the Beer Pledge, a six-year strong commitment to support member states reduce alcohol-related harm. Beer Brewers Of Europe European Union Exports Production Alcohol Non-Alcoholic Low-Alcohol Consumption Brexit.